Get this awesome free Material UI Admin template to complete your next project for app building, CMS, CRM, or project management. It's free and responsive. Once again, Creative Tim stunned us with this absolutely beautiful free material UI admin template – Material Dashboard React. The beautifully designed components, ready to use pages and custom plugins along with cutting-edge technology made this free dashboard template a powerful tool for your next web app backend. The material design was introduced by Google, and it has an immense impact on the designers and developers since the beginning. Material Dashboard React followed the guideline from Google and built the UI kit for the user’s best experience. It’s easily moldable, and people can construct an admin dashboard without constraints. It’s clean and simple, responsive and user-friendly. 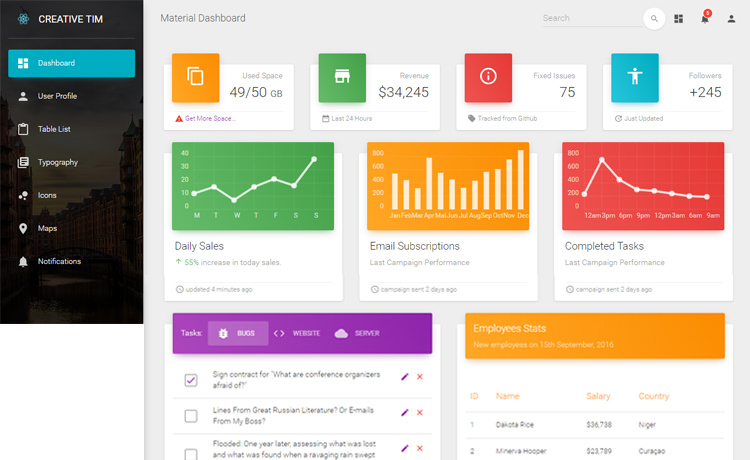 For making an app, CMS, CRM or any other system, utilize this incredible free admin dashboard template. And, the layers made the template more appealing. However, cards are amazing options from Bootstrap which lets you easily create beautiful sections for various purposes. In Material Dashboard React there are multiple cards as ChartCard, ProfileCard, RegularCard, StatsCard, and TasksCard. Use them to display your user profile, statistics and other information. The table, custom buttons, header with links, search bar, and colorful charts are available. You can also add multiple links to the dashboard in the footer which will help you to navigate through different places. Moreover, the grid system can amazingly hold the items in the prebuilt boxes which gives an engaging layout. Besides these features, the sidebar is an exclusive feature of Material Dashboard React. It’s fixed to the left, and there are filters to change the color and background image of that sidebar. In the typography, there are ready styles as Heading, Paragraph, Quote, Muted, Text, Primary, Text, Info, Success, Warning, Danger, and Small. Finally, free admin panel templates assist the developers in demonstrating their plans where the effort is less and power is more. You can check one of our blog posts to know about some of the best admin dashboard templates. Find more top-notch, enticing, and free Bootstrap admin templates in ThemeWagon which can be downloaded for free. Also for an Angular admin template, a Bootstrap 4 admin dashboard, we have a lot in our collection. Don’t forget to check all the free HTML5 templates. Both front-end and Back-end just wow. Are you sure there is bootstrap in this template?